If you have daughters, nieces, or, gasp, sons or nephews who like playing with dolls (and no, there’s nothing wrong with boys who play with dolls), then there’s a very good chance that you have dolls on the brain. And the floor, the furniture, your car, and everywhere else. While the choices in dolls may seem as endless as that hour between dinner and bedtime, there are some fun, new twists on the basic baby doll that have recently come out, and your little doll is sure to love ‘em. Cozy will make your child giggle and keep her (or him) busy for hours. Give the baby her bottle and she needs to run (or be carried) to the bathroom right away! Just put her on her included potty and she’ll wet. This is a great way to get kids interested in potty training, and to encourage them to go themselves (“Hey, Cozy Cutie’s doing it, wouldn’t you like to give it a try too?” Or, “Who can get to the toilet quicker—you or Cozy?” Whatever works, right?) In addition, kids love all things bathroom related, as we all know quite well, so you might get a few moments of peace and quiet as your child gives the bottle and gets baby to the potty over and over (and over and over) again. 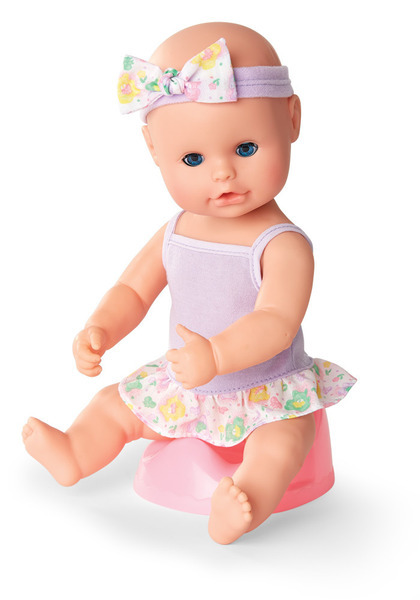 The Drink ‘n Wet doll retails for around $20 from http://international-playthings.shptron.com and comes with a removable two-piece outfit, headband, bottle, and potty seat. Drink up! This entry was posted in Reviews and tagged cozie cutie, doll, game, kidoozie, parents, peek a book dollie, playtime baby, review, toy on March 14, 2014 by Parents@Play Team. There’s nothing that says “play” better than a construction kit—and nothing that says “great way to spend time with your kids” either. So it’s no surprise that so many different manufacturers making so many different kits out of so many different materials. This week we take a look at one kit that’s traditional—in a very innovative way, and two that actually have an agenda. Before you even open the package and start building, you’d better clear your calendar because you’re going to be need a few hours, but the time will fly. 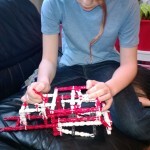 KnuckleStrutz kits are traditional in that you have a variety of pieces that you can assemble to create something. But those pieces are like nothing we’d ever seen before. KnuckeStrutz are incredibly well made: they fit together snugly—and stay that way until you take them apart to build something else. We also marveled at the engineering brains behind KnuckleStrutz who created so many pieces that can go together in so many different way. 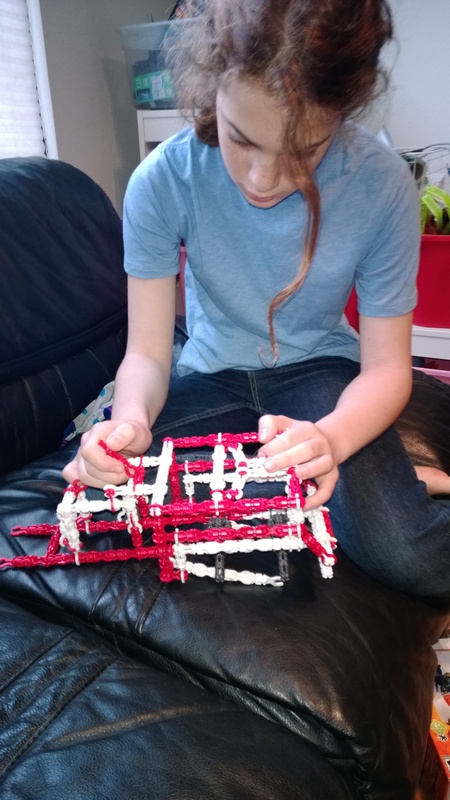 The folks behind Goldie Blox are very open about their mission: To inspire the next generation of female engineers, and along the way, they hope to help girls develop the spatial and building skills they’ll need. Each kit focuses on slightly different (but somewhat overlapping) skills. 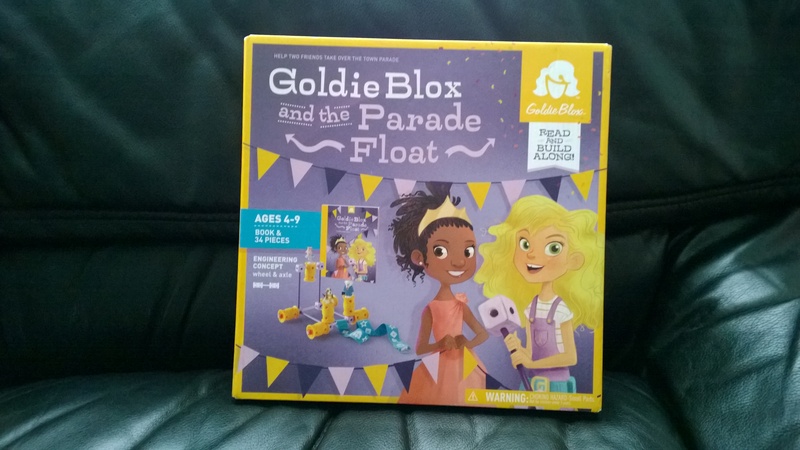 Goldie Blox and the Parade Float ($20 on Amazon) is designed to demonstrate wheels and axles, gear action, and vehicle design. 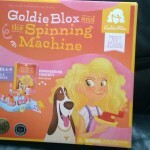 Goldie Blox and the Spinning Machine ($29) also works on wheels and axles, but adds in force, friction, and tension. 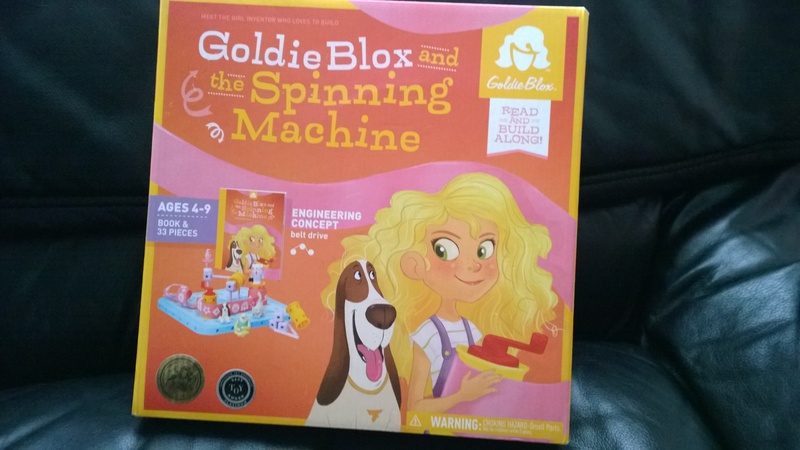 Besides the pieces, each kit contains a story book in which Goldie, her friends, and even their pets overcome challenges by building various machines. The idea is to tap into girls’ verbal skills to help them discover and develop hand-eye and engineering skills. 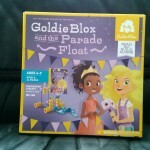 This entry was posted in Reviews and tagged boys, brott, build, construction, feuss, girls, goldieblox, knucklestrutz, parents, science on March 13, 2014 by Parents@Play Team.